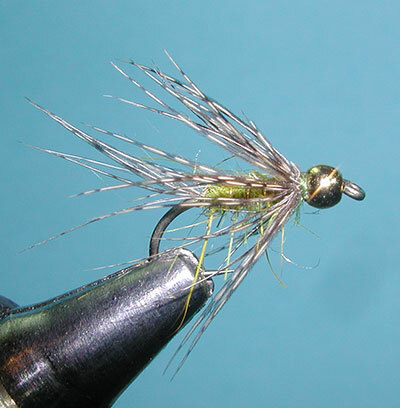 Notes: The Hare's Ear Soft Hackle is a very old pattern coming from the Izaak Walton era. Soft Hackles are basically a floss or dubbed body with a soft, webby hackle of Partridge or Grouse, or even Hen Saddle Hackle. They are meant to be fished subsurface, usually with a wet fly swing technique. The fly is often considered to represent a mayfly or caddis emerger. The main focal point of the fly is the hackle, which should be tied sparsely with the hackle fibers in a swept upright position. Often, many soft hackles bought commercially are too heavily hackled and forcibly swept back with thread wraps. 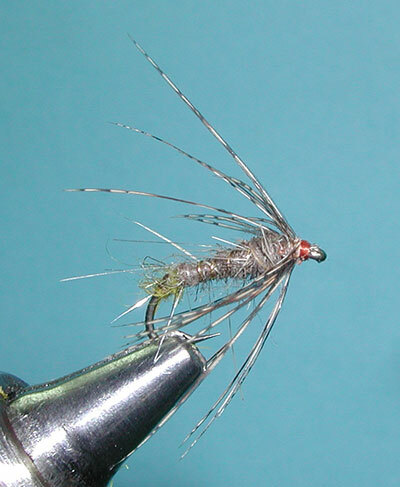 This actually negates many of the positive features of the fly since it limits the hackle action during the swing. Often, the fly is used as a wet fly swing where the fly is cast slightly downstream and across. An upstream mend is applied and the fly is allowed to drift downstream. The line tension causes the fly to sweep across the stream and rise until it is directly below you. 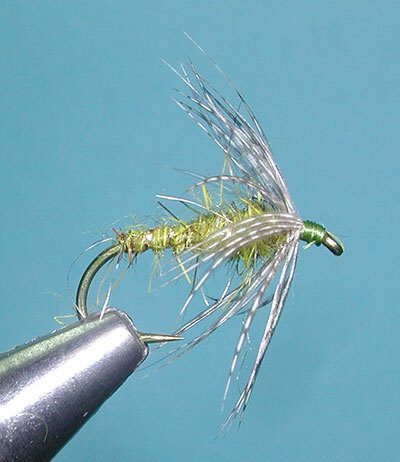 This presentation represents either mayfly or caddis emergers. You can cover quite a bit of water with this technique. After the sweep, move downstream a couple of feet and do it again. Setting the hook can be a challenge since the instinct is to lift the rod but often you just pull the fly out of the trout's mouth. A better method is to do a side arm set toward the bank which will hook the trout in the corner of the jaw. Another presentation for this fly is to cast upstream and letting the fly sink. Strip the line in as it approaches and lift the rod slowly once the fly is downstream of you. The fly will rise off the bottom in a vertical manner and strikes are usually during this rise. The technique is called a Leisenring Lift. The hook, TMC 9300, is a standard wet fly hook that is excellent within stillwaters. If you are fishing streams, you might consider switching to the TMC 3769 which is twice as heavy. The pattern is regaining favor within the Sierra Nevada due to the effort of authors and proponents such as Sylvester Nemes and Dave Hughes. Nemes wrote three books on the subject: The Soft Hackled Fly (1975), The Soft-Hackled Fly Addict (1981), and Soft Hackled Fly Imitations (1991). 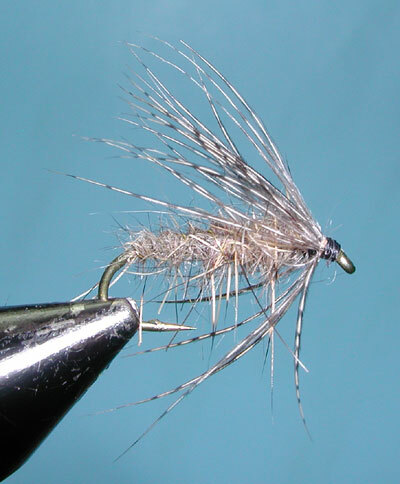 Hughes recently reaquainted us with the Soft Hackle in his book Wet Flies (1995).Nemes and Hughes often refer to Soft Hackles patterns with a floss body as these were the traditional tying methods. Often some Hare's Ear dubbing was placed within the thorax region just behind the hackle, not to represent a thorax, but to give the hackle some support for remaining upright. Since Hare's Ear dubbing is now available in a multitude of colors and textures, it is often used for the entire body and the traditional floss is ignored. Keep in mind that the primary focus of the Soft Hackle is the hackle, not the body. 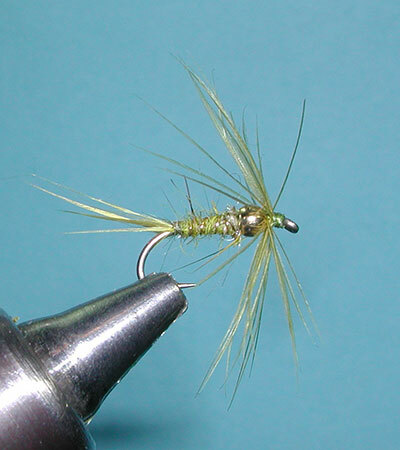 Keep the dubbed body thin with the purpose of supporting the upright hackle in mind. For an example of the floss-body, see Grey Hackle Yellow.